Throughout the six generations of success, the Lexus ES has been famous for its smooth, quiet and refined ride. Now this signature quality has been taken to an even higher level in the all-new 7th generation of the luxury sedan thanks to a detailed and innovative approach to suspension design and packaging. The attention to detail produced a new Swing Valve Shock Absorber with an ultra-low velocity valve – a world-first in the industry. In simple terms, this innovation makes sure an appropriate damping force is provided when even the slightest movement is experienced in the car’s wheels and suspension. This makes for a comfortable, unruffled ride and a stable feel, whether you’re pulling away slowly, or driving at speed on the highway. The benefit is gained in the way the flow of oil is controlled inside a new valve arrangement. 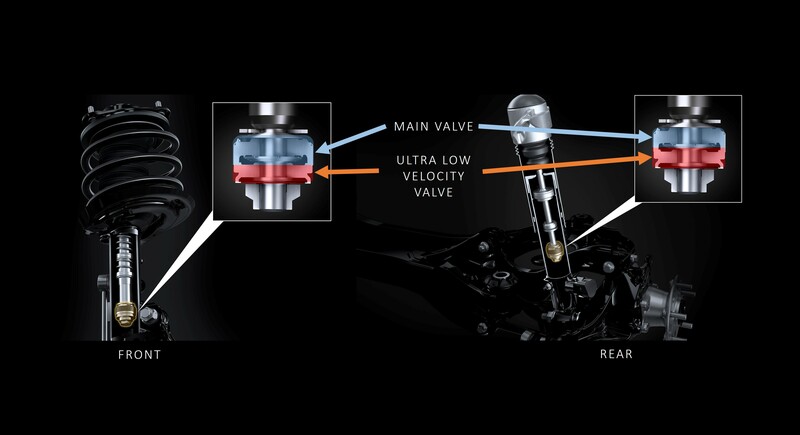 As well as a main valve, the ES’s shock absorbers have an additional ultra-low velocity valve, which allows for very low oil speed operation; at low to high oil speeds, the main valve opens to suppress the damping force, giving supple ride comfort. Delivering superior standards of both handling stability and ride comfort is a big ask but it was a challenge Lexus was ready to meet by drawing up a new double wishbone rear suspension design. Critically, the system’s trailing arms have been located with pinpoint accuracy to give the set-up the rigidity it needs to give true, linear steering response to the driver’s use of the wheel and excellent handling stability. Much of the testing to evaluate the new ES’s ride and handling took place in Europe where the development team could be sure of a wide range of road types and surfaces, from no-limit German highways, to winding mountain routes and urban streets with rough surfaces. Further testing was carried out on track, including at the famous Nürburgring, and in California. At the same time as Lexus’ engineers determined the optimum suspension performance, they also took care to produce a design that doesn’t compromise the size or convenient shape of the boot. To meet this requirement, they placed the shock absorbers closer to the back of the rear seats and mounted them separately from the coil springs.